Getting the proper vitamins in your diet is essential to have healthy hair, skin, and nails (HSN). Vitamin supplements such as biotin as well as vitamins A, C, E, and D can also help to make sure your hair, skin, and nails get the nourishment they need. Other nutrients and supplements such as zinc, omega-3 fatty acids and hyaluronic acid were also shown to help you maintain healthy skin, hair, and nails. Along with choosing the best vitamins for skin, other supplements can do wonders to improve the appearance of your skin, hair, and nails. Supplements such as zinc, omega-3, hyaluronic acid, and CoQ10 can all strengthen your hair and nails and get smooth-looking skin. In this article, you will learn about scientific research that has revealed what HSN vitamins are good for healthy skin, nails, and hair. You will also find out about the best supplements to buy if you really want to care for your outward appearance. The health of your hair, skin, and nails depends on getting the proper vitamins, minerals, and nutrients. Very often, nutritional deficiencies can affect the condition of your hair and skin as well as your nails. Of course, you should always try to get an adequate intake of vitamins and minerals from a healthy, well-balanced diet. In some cases, taking too many of some certain vitamins and minerals can negatively impact on your hair, skin, and nail health. Let’s look in more detail at the best vitamins to take if you want to get thicker hair, smoother skin, and stronger nails. 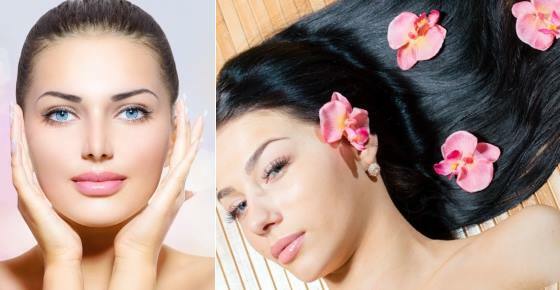 Biotin is a vitamin for hair growth because it strengthens hair and stimulates hair follicles. Biotin is also a good vitamin for nails because it prevents nails from becoming brittle. If you want to try biotin supplements to get thicker hair, strong nails, and smoother skin, you can try this biotin supplement. You can also try hair, skin, and nail gummies such as these ones that taste delicious. Many B-group vitamins can help you maintain healthy skin, hair, and nails. You can help keep your hair, skin, and nails healthy by taking this B-group complex supplement. Vitamin E is possibly one of the most important vitamins for healthy hair, wrinkle-free skin, and nails that don’t break because it is a powerful antioxidant. Try these vitamin E supplements to help keep your nails strong and your skin looking and feeling smooth. Another vitamin that you need to keep your hair looking lustrous and your skin healthy is vitamin C.
There is also research showing that certain vitamin C hair supplements promote hair growth. Try Viviscal extra strength with vitamin C to help get thicker hair and prevent thinning hair. You could also take vitamin C supplements to strengthen nail structure and keep your skin looking healthy. To get and maintain healthy skin, strong nails, and beautiful hair, you need to ensure you have enough vitamin A in your diet. Researchers say that vitamin A helps maintain skin elasticity and also helps to heal damaged skin. This vitamin A supplement can benefit your hair, skin, and nail health. You can also buy hair, skin, and nails vitamin gummies that contain a combination of great HSN vitamins and minerals. Vitamin D is one of the many hair, skin, and nails vitamins because it is necessary for cell growth and repair. Other dietary sources of vitamin D that can help give you enough vitamins for your hair and nail health are milk, eggs, fortified yogurt, and tuna. You can also supplement your diet with D vitamin that is good for hair and nails. This vitamin D3 supplement is a year’s supply and will help to boost your immunity as well. The best vitamins for hair growth, healthy skin, and strong nails will help to strengthen your overall health. You can also use some of the best supplements for skin and hair to improve the effectiveness of hair vitamins. Zinc is often found in hair and nail supplements together with biotin because it is an essential vitamin for skin health. This zinc supplement contains minerals and vitamins for strong hair and nails and may help your skin look fresher. For best hair, skin, and nails you can try omega-3 fatty acid supplement as these are critical for skin health. Fatty acids help protect your skin from UV damage, prevent fine lines, and reduce skin sensitivity. One of the advantages of taking fish oil supplements with omega-3 is that toxins that can be found in fatty fish are removed. Also, you can easily get your daily intake of omega-3 to boost your skin health without having to worry about a fishy smell. Omega-3 fish oil is also a source of vitamin D which is a good vitamin for your skin. You can buy Inversion Femme nutritional supplements if you want to improve the appearance of your skin, hair, and nails. Amino acid supplements such as L-cysteine help to build keratin that is the main structure of hair, skin, and nails. You could also try this L-cysteine supplement if you want to strengthen your hair, reduce fine lines, and get better-looking nails. Hyaluronic acid is a natural substance that helps keep skin hydrated and elastic. There is some evidence that supplements containing hyaluronic acid are good for your skin and hair. You can buy a hyaluronic acid supplement to help improve skin suppleness, get rid of fine lines, and boost the health of your hair and nails. Coenzyme Q10 (CoQ10) is an antioxidant that helps to improve the quality of your skin, hair, and nails. Try supplements with CoQ10 to help improve your hair and skin and will also get more energy.